The entire state of South Australia was without power on Wednesday night after being hit by one of the most extreme storms in 50 years. More than 1.7 million people live in the state, which is 40% bigger than Texas, covering more than 980,000 sq km (380,000 sq miles). Here's how the storm and blackout played out. The South Australia Power Networks issued a statement saying people should "be prepared for possible extended power outages" and that they "expected access issues due to weather". The forecast predicted wind gusts exceeding 90km/h across much of the state and up to 120km/h in the Adelaide Hills. Significant thunderstorm activity was also forecast to last for several days. The storm front hit the state capital, Adelaide, around midday lashing the city with gale force winds and heavy rain. A low pressure system generated twin tornadoes, which swept across parts of the state, taking out power lines. The power network authorities had to ask people: "Do not report outages." A local resident named Paula saw a tornado approaching as she picked up her son from school at Blyth, a small town north of Adelaide. "I've just never seen anything like it," she said. "Just the colours in the sky, the greys and purples and the white, and it was just spinning. "It wasn't like a twister. It was very wide and was just turning in a very fast motion and yeah, it got a bit scary there." The state-wide power cut hit at around 15:45 local time, plunging towns into darkness. Transport was thrown into chaos at the peak travel time, with planes grounded, trams and trains shut down and traffic gridlock in Adelaide. How did authorities deal with the blackout? In Adelaide, police hit the streets to manage the traffic chaos as traffic lights went out. The State Emergency Service responded to more than 4,000 incidents before 19:00, as crews worked to clear roads and prevent homes from being flooded. Hospitals operated on emergency generators and shops and businesses were forced to close. One woman, identified only as Dee, said she had been on an operating table at Flinders Medical Centre when the power went out. "Everything just went black, and my blood pressure, I'm sure, went completely through the roof," she told ABC radio. "I lay there on the table for about an hour while we waited for the Bureau of Meteorology to give some advice as to what was happening." How did ordinary people deal with it? Some people managed to stockpile candles, batteries and other items to last them throughout the night. Many locals saw the lighter side of the blackout conditions, making their own fun in indoors. 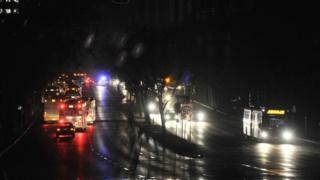 By Thursday morning, power had been restored to most of the Adelaide metropolitan area. Twenty-four hours after the blackout power had been restored to 90% of households, with 70,000 people still without electricity. But about 40,000 people, mostly in the state's north, have been warned power may be off for days. Opposition leader Steven Marshal said serious questions must be answered by the state government. South Australia Premier Jay Weatherill defended the handling of the freak storm, saying it was "unprecedented" and that little could have been done to prevent the state-wide power outage. Influential federal Senator Nick Xenophon called for an independent inquiry, calling the power outage a "disgrace". Federal Energy Minister Josh Frydenberg triggered a bitter political row after suggesting South Australia's high levels of renewable energy left the state vulnerable. However, federal opposition leader Bill Shorten said it was "poor form" for the government to make political points about renewable energy while the crisis was ongoing. On Thursday, the emergency authorities warned people to leave work early, stay at home and stay safe, as conditions were expected to worsen. The superstorm is expected to move eastwards along the south coast of Australia over the next 24 hours. Coastal flooding from rising tides, "mean winds" and heavy rain has been forecast to sweep South Australia. Floods in northern parts of Victoria could rise with heavy rain forecast but Melbourne is tipped to be spared from the deluge. Similarly, between 40mm to 100mm of rain is expected to hit central parts of New South Wales. Sydney is likely to avoid the worst of the wild weather. Weather warnings are in place for the Australian Capital Territory and northwest Tasmania.